Production manager Dave Luttrell pictured with a vintage, automatic, screen printing press. Yes, he’s really that into this! One of my favorite SNL characters in the 90’s was “the Copier Room Guy” by Rob Schneider. When I worked at a small shop in Omaha at the time, running a 6-color manual press, we would do that routine while we screen printed “copies” of logos onto t-shirts and stuff. It was great fun and we enjoyed each other and what we were doing. 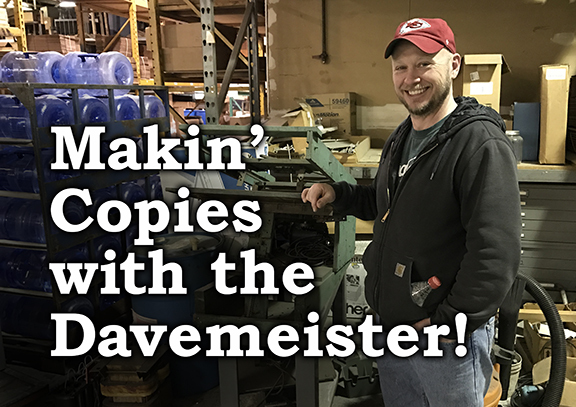 My Name is Dave Luttrell and I’ve been makin’ copies with screen printing since 1987. Starting in a friend’s basement to currently overseeing a production staff running 6 printing presses and several heat transfer presses. I absolutely love the art/craft/science of screen printing and garment decorating. Of all the decorating options out there why pick screen print? Well let’s look at some things to consider. Embroidery, it offers a very high-quality look but limited to thread colors and the lower production speeds that tends to increases overall costs per item. Transfers, either screen printed, cut from vinyl or printed digitally. Great for low quantity runs but there are things to consider when making this choice. Digital direct to garment, also great for low quantity runs because it’s a computer printer that prints directly onto fabric…not a lot of shops use this because the technology is costly as well as constantly being updated and the types of garments it works best on is very limited. Screen Print, it’s not always the best option for low volume orders. The pre-press work involved includes color separated artwork (1 screen per color in the design) with the substrate (shirt, bag, jacket etc..) in mind. This color separated art is imaged onto film and used to develop the screens. Screen printing also involves the prepping and imaging of screens, as well as setting up the press and registering the art (putting all the colors back together again with ink). It may also include mixing custom ink colors. All this before the first “copy” is made. Those may be considered the “cons” because this is where the setup costs are but let us examine some of the “pros”. Highly detailed images are generally very manageable with screen printing. Logos up to but not limited to 6 colors are standard industry work. The variety of products that work well with screen printing is constantly expanding. Everything from stretchy yoga pants to T-shirts and athletic gear to hats and other types of head wear. Even the grip texture on the bottom of some socks is screen printed. Literally from head to toe screen print has you covered. Speed. This is where screen printing outruns the other options for higher volume orders and brings the costs per copy down. Once the pre-press work is done and the press operator begins the run, actual production begins. You may have noticed that pricing breaks begin to happen at certain quantities as the costs per copy goes down. That is because once the setup costs are covered the actual costs of image reproduction levels off and higher production speeds take over. A skilled automatic press operator can generally hit production runs of anywhere from 500-1000 “copies” per hour depending on the job specifics. Even the operators running manual presses can hit speeds of up to 200 per hour under the right conditions. This makes screen printing a very attractive option. Quality. This is what sets many screen printers apart. An experienced team of sales representatives, artists and production staff can do amazing work guaranteed to bring your idea or company logo to the front and center. There is something special about seeing a high-quality version of your design on something you can wear. I feel that we have all that and more here at Abante Marketing. I am proud to be a part of an excellent team that takes their roles seriously and takes great pride and enjoyment in their work. Even if it is “makin’ copies”. I look forward to sharing more with you in future articles here. Subscribe to receive updates on the latest additions to "Things You Should Know" the Abante Marketing blog.